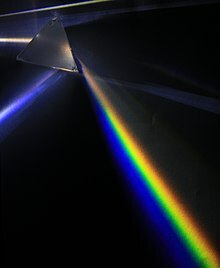 Optics includes study o dispersion o licht. Optics is the branch o pheesics which involves the behaviour an properties o licht, includin its interactions wi matter an the construction o instruments that uise or detect it. Optics uisually describes the behaviour o veesible, ultraviolet, an infrared licht. Acause licht is an electromagnetic wave, ither furms o electromagnetic radiation such as X-rays, microwaves, an radio waves exhibit seemilar properties. This page wis last eeditit on 13 Mairch 2014, at 15:02.